When Dublin and Kerry collide in this Saturday's NFL1 tie in Tralee (7.0) it will be the 50th League meeting of the counties. At the moment the Kingdom hold the edge having won 22 of the clashes, compared to 21 by the Dubs, six have ended in a draw. The recent history of the teams in NFL action tells a similar tale - Dublin won last year, Kerry won the 2017 NFL1 final in Croke Park while the regulation game that year was a draw in Tralee. Here we glance back at those three head-to-heads. A storming second half saw Dublin outclass Kerry by 12 points in this NFL Division 1 duel at Croke Park in front of an attendance of 24,026. The Dubs then stood on the cusp of qualification for the top-flight league decider as they headed to Salthill the following weekend before they face Monaghan in Croker in their last regulation game. However, the sight of Cian O'Sullivan being taken off with what looked a bad shoulder injury was a worrying concern as the Dubs are already without Jack McCaffrey for several more months. Dublin led 1-8 to 0-8 despite a slow start but then hit the turbos to score 1-6 unanswered and but for spurning some second half goal chances could have prevailed by an even more convincing margin. The Kingdom had the goal chances also, but let two opportunities go in the opening half when Paul Geaney hitting and upright and young Seán O'Shea, a minor All-Ireland winner in 2015 and '16, shanking wide from close range with Stephen Cluxton stranded and only Jonny Cooper on the line. Kerry started well with David Clifford, a minor of the last two years, impressing early on and taking Cian O'Sullivan for two points form play as well as a free which he won himself. The switch of Jonny Cooper onto Clifford helped Dublin but it was far more than that as Jim Gavin's men upped their tempo, movement and work-rate after a sluggish opening. At midfield Brian Fenton and especially Michael Darragh Macauley took the game to Kerry and Dublin dictated the game for the most part bar the opening 20 minutes. Dublin's first goal was a great example of their pace and power. A free from Clifford was brilliantly cut out by the impressive Cooper and eventual Dublin emerged a pace through David Byrne, the ball was taken on by Brian Fenton before Shane Carthy's point effort was parried upward with Niall Scully arriving to fist the ball to the net, much like he had done for his goal against Mayo. Byrne performed the same lung-busting run in the second period also to become the link man for a second half point. The second half was a different story as Dublin dominated the opening 20 minutes and overall, either side of half-time, it was almost 30 minutes between Kerry scores. “Coming up to half-time, we tightened up on our passing which was a little bit loose in the first half,” said Dubs manager Jim Gavin. Ciarán Kilkenny, who enjoyed a very productive afternoon, grabbed Dublin's second goal as they came raiding with intent again. His initial attempt was saved by Shane Murphy but he scrambled the rebound home. Dublin could have had more goals but both Dean Rock and Ciarán Reddin were denied by the same upright at the Davin End. SCORERS – Dublin: C Kilkenny 1-3, D Rock 0-4 (0-3f), N Scully 1-1, P Andrews 0-3, C Basquel 0-2, C Costello, J Cooper, P McMahon, P Small 0-1 each. Kerry: D Clifford 0-4 (2f), K McCarthy, M Burns 0-2 each, S O’Shea, P Geaney, M Geaney 0-1 each. DUBLIN: S Cluxton; D Byrne, J Cooper, C O’Sullivan; S Carthy, J Small, E Lowndes; B Fenton, MD Macauley; N Scully, C Basquel, B Howard; P Andrew, C Kilkenny, D Rock. Subs: P Small for Carthy (17), P McMahon for J Small (ht, black card), C Reddin for P Small (52, temporary), P Small for Rock (58), A McGowan for O’Sullivan (64 inj), C Costello for Kilkenny (68), E Ó Conghaile for Fenton (68). KERRY: S Murphy; P Murphy, J Foley, R Shanahan; P Crowley, B Ó Beaglaoich, S Enright; J Barry, B O’Sullivan; M Burns, S O’Shea, A Spillane; D Clifford, P Geaney, K McCarthy. Subs: É Ó Conchúir for O’Sullivan (33, black card), M Geaney for O’Shea (ht, inj), BJ Keane for P Geaney (ht), F Fitzgerald for McCarthy (48), D Moran for Spillane (50), D Casey for Burns (64). Dublin's stranglehold on the NFL Division 1 title was broken by a ravenous Kerry side in this pulsating encounter in Croke Park. An attendance of 53,840 flocked to GAA headquarters for a great double header and in the top-flight duel the Dubs fell just shy with Dean Rock hitting the right upright with the last kick of the match in the fourth minute of added time. These counties have served up some memorable games during their modern rivalry and Sunday's most recent installment did not lack for intensity or drama. Dublin led by the minimum, 0-10 to 0-9, at the break but it was Kerry's scoring surge on the restart which ultimately decided the game. The Dubs, as ever, fought to the end with the introduction of Michael Darragh Macauley, Paul Mannion - who scored 1-2 from play - and Kevin McManamon injected life into a Dublin display that played second fiddle to the Kingdom for stretches of the contest. Kerry looked hungrier around the breaking ball and in many respects beat Dublin at the own game with the half-back line breaking forward with pace and power to put the Dubs on the back foot, particularly during that key third quarter. The black card for Diarmuid Connolly in the 30th minute didn't help Dublin's cause, to state the obvious, as the St Vincent's forward was showing signs of becoming an influential character in the game. Goal-scoring chances were at a premium but Stephen Cluxton did superbly to deny Kerry on two occasions and after the second one Philly McMahon foiled Kerry on the follow-up. Kerry hit five unanswered points at the start of the second half and unlike on so many occasions during this league Dublin could not find the winning scores. Dublin's goal arrived eight minutes from time with Michael Darragh Macauley breaking though the Kerry defence before off-loading to Mannion who did excellently to cut back on his less favoured right foot and slide the ball to the net to make it 0-17 to 1-13. However, a Paul Geaney free and David Moran score from play gave Kerry breathing space, Dublin came again but Bryan Sheehan curled over a fine point on the run. But Dublin came once last time. Mick Fitzsimons was breaking through the middle at pace but was hauled down by Anthony Maher, who was shown a black card, up stepped Dean Rock but his long-range effort was inches away from forcing extra-time. "Disappointed with that performance. Too many unforced errors. Gave the ball away too much - certainly had enough of it. The third quarter of the game, we kicked an awful lot of the ball away," says Jim. "But all credit to Kerry. Their score execution was very good there today. They got some great points and fully deserved the win, so hats off to them." The Dublin boss reckons that Dublin were careless in possession and were punished clinically by Kerry. "Just turned it over needlessly. Kicked it away, handpassed it away – very uncharacteristic. But it certainly punished us, and put us in a very tough position going down the stretch, five points down. "I thought they showed great heart again, great resilience to come back and be within the width of a post to put the game into extra-time, a long-range free from Dean (Rock). And we had a bit of momentum at that stage, but unfortunately this time a little bit too late. "When a lack of a performance happens like that there today, it's ultimately my responsibility. "But the preparations went very well this week, great energy, great focus by the players. We knew, as they always are, Kerry/Dublin games are very demanding and there was a national final, a cup on the table to be won. So we knew it was going to be a very tense game, which it turned out to be. "So no, you couldn't fault the preparations. Team selection? Absolutely, that's my responsibility and we'd have to have a look at that – did we start the right players and bring the right players in? "But I thought the boys who finished the game had great heart and desire, and again I couldn't question their resilience again there today – just a little bit too late." SCORERS - Kerry: P Geaney 0-8 (0-5f), D Moran 0-3 (0-1 '45'), M Geaney, D Walsh 0-2 each, P Murphy, J Barry, K McCarthy, J Savage, B Sheehan 0-1 each. Dublin: D Rock 0-6 (0-4f), P Mannion 1-2, C Kilkenny, C Reddin 0-2 each, P McMahon, J McCarthy, P Flynn, D Connolly 0-1 each. KERRY: B Kealy; R Shanahan M Griffin, F Fitzgerald; T Morley, P Murphy, P Crowley; D Moran, J Barry; J Lyne, M Geaney, D Walsh; K McCarthy, P Geaney, J Savage. Subs: G Crowley for Lyne (bc, 27), D O'Sullivan for Savage (59), BJ Keane for McCarthy (62), B Sheehan for Walsh (67), A Maher for Barry (70), A Spillane for M Geaney (72). DUBLIN: S Cluxton; P McMahon, M Fitzsimons, D Daly; J McCarthy, C O'Sullivan E Lowndes; B Fenton, C Kilkenny; P Flynn, D Connolly, C Reddin; B Brogan, D Rock, P Andrews. Subs: N Scully for Connolly (bc, 30), P Mannion for Andrews (41), MD Macauley for Reddin (48), K McManamon for O'Sullivan (49), D Byrne for Lowdes (60), E O'Gara for Flynn (68). 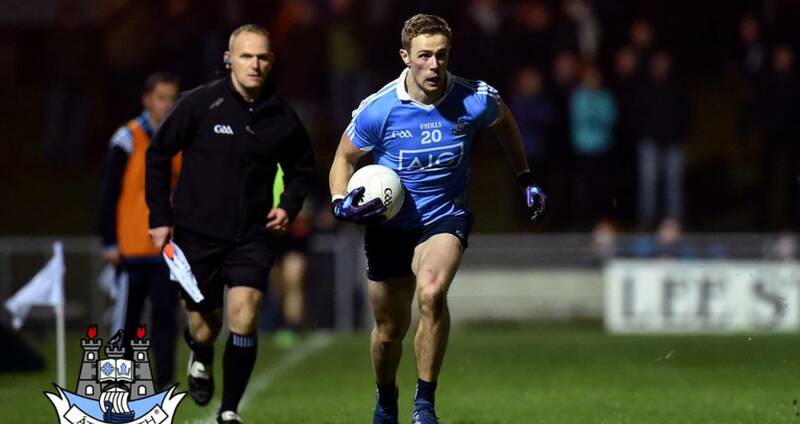 Dublin showed true grit to salvage a draw in this NFL Division 1 battle with Kerry in Austin Stack Park, Tralee. In very blustery conditions it was a real physical contest with late scores from Dean Rock (free) and sub Paul Mannion deservedly granted the Dubs a share of the spoils. The counties were level at half-time before a pulsating second half. Kerry moved four up at one stage before Dublin brilliantly lifted their game massively following the introduction of Paul Flynn, Kevin McManamon and Eoghan O'Gara to move two up themselves. The game oscillated in the dying minutes with Kerry looking set for victory as they established a two-point cushion but Dublin kept going to the end to secure the draw. “They had a big breeze in the second-half and they pulled four ahead, with 72 minutes gone and two down, but we’ve always stayed present in games and tried to get the scores," said Dublin manager Jim Gavin afterwards. “We played our traditional style of football and got the draw in the end. That’s expected in a team game and this football team is more than the sum of its parts - that has been its strength in previous games,” added Jim. Kerry opened the better in the opening half with scores from Peter Crowley and Paul Geaney before Dublin eventually responded through a Dean Rock free and fine point from play from Conor McHugh, following good work from Eric Lowndes. Three Dean Rock frees had Dublin in front heading towards the interval before Stephen Cluxton performed an excellent reflex save to deny Paul Geaney from close range as he redirected his thunderbolt over for a point. The Kingdom began the second half in top gear with points from Paul Geaney, David Moran and Kevin McCarthy. By the 45th minute Kerry were four points to the good, then Dublin hit their best passage of the night with the freetaking of Rock punishing Kerry's many indiscretions as well as McHugh and O'Gara firing points to put Dublin two up by the 55th minute. Dublin almost had a goal but Conor McHugh was denied by Mark Griffin on the line, before Griffin and keeper Brendan Kealy stopped Brian Fenton's follow-up effort, with a suspicion of the ball being handled on the ground by the defender in-between. The drama in this contest was far from over as Kerry made a resounding reply with Geaney slotting two frees and points from BJ Keane and Donnchadh Walsh edging the hosts two in front. Dublin were not going to give up though as Rock (free) and Mannion, who had been introduced for the injured John Small, had the final words. Ciaran Kilkenny was dismissed in the last minute of added time for a second yellow card offence. SCORERS - Kerry: P Geaney 0-7 (0-4f), P Crowley, D Moran, B Kealy (0-1 '45'), BJ Keane, K McCarthy D Walsh 0-1 each. Dublin: D Rock 0-9 (0-9f), C McHugh 0-2, E O'Gara, P Mannion 0-1 each. KERRY: B Kealy; M Griffin, S Enright, R Shanahan; P Crowley, T Morley, K Young; D Moran, J Barry; A Spillane, P Murphy, D Walsh; J Savage, P Geaney, K McCarthy. Subs: J Lyne for Enright (16, inj), S O'Brien for Savage (ht), BJ Keane for Spillane (52), A Maher for Barry (54), D O'Sullivan for McCarthy (61), M Geaney for Young (61, inj). DUBLIN: S Cluxton; D Daly, P McMahon, M Fitzsimons; J Small, D Byrne, E Lowndes; B Fenton, MD Macauley; N Scully, C Kilkenny, SB Carthy; D Rock, P Andrews, C McHugh. Subs: C O'Sullivan for Byrne (ht), P Flynn for Scully (41), K McManamon for Macauley (44), E O'Gara for Andrews (46), P Mannion for Small (48, inj), B Brogan for McHugh (69).